It’s Friday! They don’t come around quick enough! This week we’re looking at covers by Rockabye Baby! and I have to say it’s been a lot tougher than I thought. 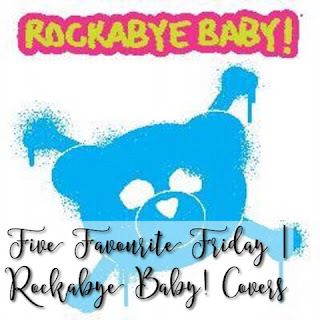 If you haven’t heard of Rockabye Baby! then go visit their website and take a listen. They do covers of various artists and albums designed to be relaxing enough to send a baby to sleep whilst being stimulating enough for adults to listen to. 5. Clocks. A cover of Coldplay’s song. I love Coldplay’s version so it’s natural that I love this cover. 4. Under Pressure. They really pulled off this cover of Queen’s song. Not an easy thing to do! 3. Yellow Submarine. Because who doesn’t love a song about living on a yellow submarine? 2. All You Need Is Love. Another Beatles cover. I love this one as this was the first song Alex ever heard, so it means so much more. 1. Good Riddance (Time Of Your Life). My favourite song. And a great cover. Even this version gets me feeling emotional! And there’s my top 5. It’s been really difficult choosing as they have so many amazing covers. I highly recommend listening to their stuff and if you have young children who like a lullaby at bedtime, these make a great alternative to the ones you might be used to! As ever, head over to Broken Thoughts to read Tim’s post and to find out what our topic for next week is! Next Post Update | Where Have I Been?